THE BRITISH RAILWAY STORIES LTD: "Over Exerting?" Every so often I stop and take a look at myself. 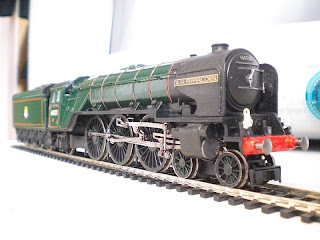 One of the problems I've had over the last few years is dealing with difficult situations, and one of the solutions I found was railway modelling. I find it amazing that around this time last year, I was wondering if I'd be around this time, this year to actually make a go of any of my "dreams" or reality. After months of hospital visits, several surgeries on various body parts and general ill health for well over two years, I'm proud to say I've come out the other side and still around to tell the tale. Recently I was quite vitriolic on a particular forum about one product and its absence from the shelves over the course of a year. There's been other mitigating factors, a related product which was a present for my father - delivered, and damaged badly in transit - the fact that other products from the new range have been delivered ahead of it - and couple that with my current condition (awaiting a knee operation to add to my complete list of medical "general overhauls"), the frustration simply got to me over the last few weeks, and it ended up with an outburst that, while unpleasant most certainly, was at the very least honest and to the point. I got some messages from other forum members advising me of patience and basically a telling off in some respects. They are right, of course, but that does not stop me feeling infuriated to be singled out. The answer is, I didn't even think of it. Or perhaps it was laziness. Or both. A very wise Blogger, from the depths of time, once said to me that we take it all far too seriously as a hobby and that the sheer amount of "froth fests" we all indulge in from time to time wasn't worth our time or effort. He was - is - right. Today, I frothed and foamed and whinged and moaned, about a model train when (putting it in perspective), there are people dying out there from various political situations, there are countries like Zimbabwe where the exchange rate is 10,000,000,000,000 of their currency to a single dollar! There are kids and adults and families caught up in war, and there are lots of other, much more important things to worry about than the model in question. 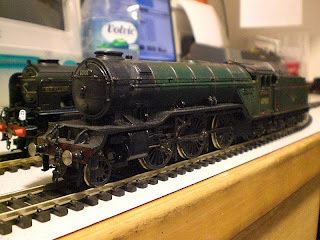 A further problem is now the modelling - before, just done to appease my desire for a train set to watch trains whizzing round and round - is now being done for a purpose, and suddenly is begining to feel, hold the phones! Like a chore. I have found it a struggle to get any modelling done when its for one of the youtube films recently (a year ago the stories too, were a source of comfort in a dire situation), yet give me a competition to make a "fun" model in and all I've been doing is studying my chosen prototype, mixing up paint samples, ordering parts and then starting building a model which, actually, hasn't any value to the series or monetary value. That then is the crux. The modelling which isn't being done to fulfill a specific role is enjoyable. 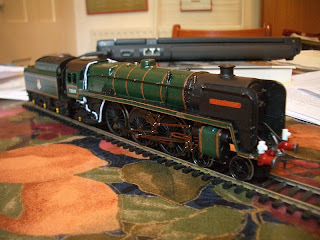 The modelling which may not be every single rivet checked and modelled, but that which is simple and straightforward. So the question I now have to ask is - where do I draw the line, and what can I do to get my modelling - the modelling I enjoy - back on track (pun intended)? b) Releasing Youtube videos which are meant to be a bit of fun, not serious drama! And d) stop over analysing everything and enjoy life a bit more without worrying about every little thing.